MATES in Construction National Helpline – 1300 642 111. Offers FREE case management and support to construction workers and their families. The Working Away Alcohol and Drug Support Line – Confidential telephone support, information and referral service for those working away from home, their families and employers who are concerned about their own or another person’s alcohol or drug use or mental health and wellbeing. The service is available 24/7 via phone. Mining Family Matters – A web-based organisation sponsored by a range of oil and gas companies, provides support via an online community, e-newsletters, chat forums, publications such as the ‘Survival Guide for Mining Families’ and ‘Working Away: A Survival Guide’. Miner’s Promise – An Independent not-for-profit member-based organisation established to support employees of the resources sector and their immediate family by providing practical, emotional and financial support when impacted by a crisis event or death. FIFO Families – A commercial web-based organisation that offers support to FIFO Families. 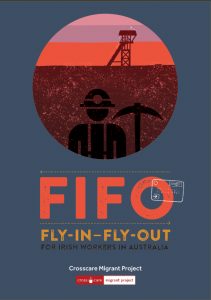 The organisation provides opportunities for support and connection with other FIFO families through a range of resources including links to chat rooms, forums, seminars and e-newsletters. This FIFO Life – Mental health professionals Julie Loveny and Sue Crock, are experienced social workers and the coordinators of This FIFO Life, a mental health online resource developed for FIFO workers and their families with funding from the WA government. The Claddagh Association Inc. (Perth, WA) – A voluntary non-profit organisation that aims to provide crisis support to people from the Irish community in times of hardship and trauma. They provide a safety net to assist people in crisis situations where all other avenues have been exhausted.